Zwitterionic ion-exchangers represnt a new direction in the development of stationary phases for different modes of high-performance liquid chromatography. 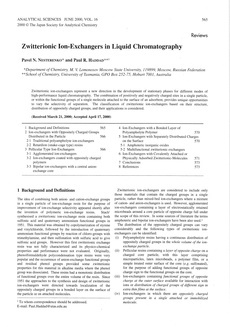 The combination of positively and negatively charged sites in a single particle, or within the functional groups of a single molecule attached the surface of an adsorbent, provides unique opportunities to vary the selectivity of the separation. The classification of zwitterionic ion-exchangers based on their structure, distribution of oppositely charged groups, and their applications is considered.